Impact crusher crushes materials by rotary board hammer and impact plate. In this process, the board hammer and impact plate are easy to be damaged because materials are pounding them continuously, and the efficiency will be reduced accordingly. Materials are hit by board hammer, so impact crusher has to bear impact force produced by this, and then this process is repeating for materials crushing. There are polygonal-shaped impact crusher and arc-shaped impact crusher according to force analysis. 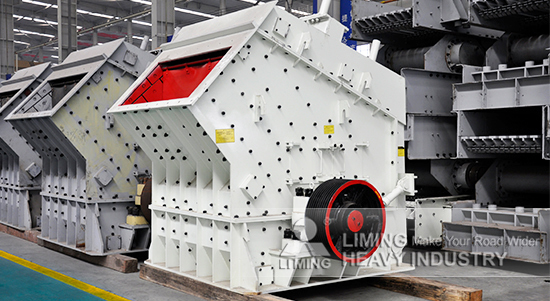 Polygonal-shaped impact crusher can crush materials vertically and the effect is pretty good. Arc-shaped impact crusher can make materials rebounded to a circular crushing area for processing, which realizes free crushing. The impact plate is usually made of wearable steel plate, and its impact surface is equipped with scaleboard, which makes abrasion performance better. The board hammer is fixed on rotor. When the rotor driven by motor is spinning at a great lick, board hammer works accordingly, and materials are crushed. Because board hammer spends much time contacting with materials, it is important to select suitable raw materials, such as high-chromium iron, high-manganese steel or wear-resisting alloy steel for board hammer. Different shapes cause different effects. Now board hammer usually uses strip structure, and there are T-shaped, S-shaped and I-shaped hammers providing for customers according to different requirements.